In Thacker v. Tennessee Valley Authority, the government contends (and the lower courts agreed) that the TVA should be immune from tort liability to shield executive policy-making, even when the TVA is engaged in arguably commercial activity. The petitioner, Gary Thacker, argues that an entirely different analysis applies to the TVA, which Congress has made broadly subject to suit without expressly preserving policy immunity. For its part, the government insists that, even though the TVA is specifically excluded from the Federal Tort Claims Act, which governs other federal government tort suits, the FTCA’s discretionary function exception should be judicially implied here. Under 28 U.S.C. § 2680(a) of the FTCA, the United States is protected from tort liability based on a federal employee’s exercise or failure to exercise a “discretionary function or duty … whether or not the discretion involved be abused.” The government argues that, as a matter of constitutional separation of powers, the discretionary function exception prevents “judicial second-guessing” of any decision that is susceptible to policy analysis, including TVA choices about safety measures. As Justice Sonia Sotomayor stated at the beginning of Monday’s oral argument, the TVA surely would be entitled to policy immunity for “core government activity.” The question is where to draw a line between protecting the TVA from tort liability when it is engaged in quintessential government functions and holding the TVA accountable for negligence when it acts in a manner similar to other commercial enterprises. 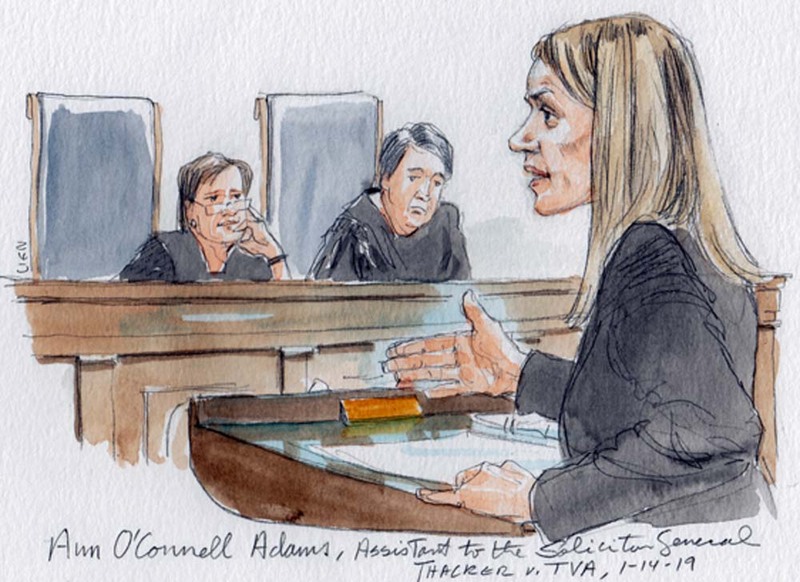 While counsel for both sides sometimes approached a categorical answer — that immunity is always or is never available to the TVA — the justices experimented with different tests and proposed varying dividing lines. Arguing on behalf of Thacker, Franklin Rouse resisted any suggestion that the Federal Tort Claims Act’s discretionary function exception should be read into — or provide any analytical guidance for — the statute that authorizes the TVA to sue and be sued. Rouse contended that, under the Burr test, immunity is granted only when liability imposes a “grave interference” with the TVA’s governmental role — “a different inquiry in kind” from the FTCA’s discretionary function exception. 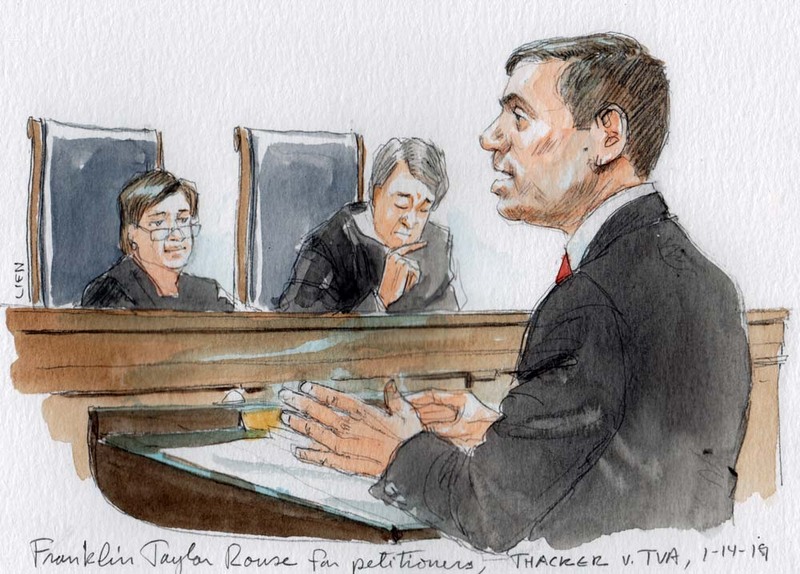 Although Rouse agreed with Alito and Kagan on the outcome, he denied that there is a “line for these entities between commercial and governmental.” Even when acting in a governmental capacity, the TVA remains subject to liability absent a showing of grave interference with its functions. Chief Justice John Roberts asked whether the TVA would be immune when managing flood control if, by allowing more water through the dam, downstream farms would be damaged, while by keeping water back, upstream farms might be harmed. Rouse argued that the TVA remained subject to liability for flood-control activities under the general statutory authorization for suit against the TVA. Justice Brett Kavanaugh restated Rouse’s argument as asking the Supreme Court “to simply hold that the right test is Burr, instead of the discretionary function exception.” Rouse allowed that Thacker could “live with that,” noting that the lower courts had bypassed the Burr grave interference test. 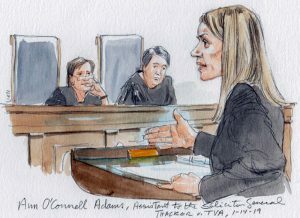 Arguing for the TVA, Assistant to the Solicitor General Ann O’Connell Adams began with the heart of the government’s case. She contended that discretionary function immunity is “grounded in constitutional separation of powers principles.” For that reason, the TVA enjoys that protection, even absent express statutory provision. Sotomayor and Kagan focused on whether the government’s reading means that the TVA’s tort liability would be identical to that for other federal agencies under the FTCA, even though the TVA is expressly taken out of the FTCA. Adams said, “[i]n terms of discretionary decision-making, yes.” But she pointed out there are other procedural requirements in the FTCA that are not imposed against those suing the TVA. Kagan asked Adams for examples of negligence suits that could be brought with respect to “the TVA’s actual operations in running a power company.” Adams acknowledged that she could not provide examples from case law to illustrate such a difference between FTCA liability and TVA liability. Kavanaugh brought the conversation back to Burr, contending that for sue-and-be-sued entities like the TVA, Burr “sets up what seems to me on its face to be a higher bar or a … narrower exception than the discretionary-function exception because it uses terms like ‘grave interference’ with governmental function.” Adams responded that denying the TVA a discretionary function exception would constitute a grave interference with governmental function. Not satisfied, Kavanaugh again referred to the “high bar” set in Burr and asked whether a “broad discretionary-function exception” is truly necessary “to avoid grave interference with the performance of a governmental function.” Adams stood by her contention that the Burr interference test leads right back to discretionary function immunity for the TVA. She explained that the facts of a particular case may take it outside of immunity under the tests for application of the discretionary function exception — but the Supreme Court declined to accept review on the application question. Speaking briefly on rebuttal, Rouse characterized the government’s argument as “trying to smuggle in the discretionary function analysis” under the Burr test and constitutional separation of powers. He reiterated his central argument that the FTCA’s discretionary function analysis simply does not apply to the TVA because it was broadly made subject to suit by Congress.